The Beatles, "Your Mother Should Know" (1967): Deep Beatles. Beatles Radio: The Beatles, Solos, Covers, Birthdays, News The Fab 4 and More! One of Magical Mystery Tour’s most memorable sequences remains the ending, when the Beatles jog down a staircase in all white tuxedos, surrounded by an assortment of women in ballgowns, others in military garb, and more. 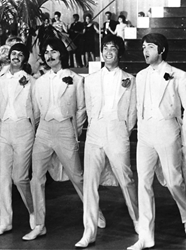 Paul McCartney’s grin and exaggerated dance moves illustrate how much he enjoyed filming the scene, perhaps because the four were dancing to one of his own compositions: “Your Mother Should Know,” a track written specifically for a big production number. In addition, the song pays tribute to his father’s music hall background as well as his family’s deep love for the genre. As McCartney told biographer Barry Miles in Many Years from Now, he envisioned a Busby Berkeley-style number while writing the song. He wrote it at his Cavendish Avenue home on a harmonium.